GRAND CANYON NATIONAL PARK— The Havasupai tribe and three conservation groups today sued the U.S. Forest Service over its decision to allow Energy Fuels Resources, Inc. to begin operating a uranium mine near Grand Canyon National Park without initiating or completing formal tribal consultations and without updating an outdated 1986 federal environmental review. The Canyon Mine threatens cultural values, wildlife and endangered species and increases the risk of soil pollution and pollution and depletion of groundwater feeding springs and wells in and near Grand Canyon. The lawsuit alleges violations of environmental, mining, public land and historic preservation laws. 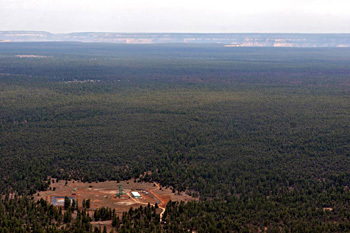 The “Canyon” uranium mine, seen here in the foreground, with Grand Canyon National Park six miles to its north. Photo by Bruce Gordon, Ecoflight. "We regret that the Forest Service is not protecting our sacred site in the Red Butte Traditional Cultural Property from destruction by uranium mining,” said Don Watahomigie, chairman of the Havasupai tribe. “The Havasupai are returning to the federal courts to protect our people, our religion and our water." The mine is located within the boundaries of the Red Butte Traditional Cultural Property, which the Forest Service designated in 2010 for its critical religious and cultural importance to several tribes, especially Havasupai. As a “traditional cultural property,” Red Butte is eligible for inclusion on the National Register of Historic Places. The lawsuit alleges that the Forest Service violated the National Historic Preservation Act by failing to undertake any process, as required by the Act, to consult with interested tribes to determine how the adverse impacts of the mine on Red Butte could be avoided or mitigated prior to approving mining. The mine falls within the 1-million-acre “mineral withdrawal” approved by the Obama administration in January 2012 to protect Grand Canyon’s watershed from new uranium mining impacts. The withdrawal prohibits new mining claims and mine development on old claims lacking “valid existing rights” to mine. In April 2012, the Forest Service made a determination that there were “valid existing rights” for the Canyon mine, and in June it issued a report trying to explain its decision to allow the mine to open without updating the 27-year-old environmental review. The lawsuit also alleges that the Forest Service violated the National Environmental Policy Act for failing to conduct a “supplemental environmental impact statement” to analyze changes in the planned mining and new science and circumstances that have arisen since the mine’s 1986 environmental impact statement. Those include the 2010 designation of the Red Butte Traditional Cultural Property, reintroduction of the endangered California condor, and formal and informal authorizations. Scientific studies published since 1986 demonstrate the potential for rapid aquifer recharge and connectivity between perched and deep aquifers and regional springs and creeks. 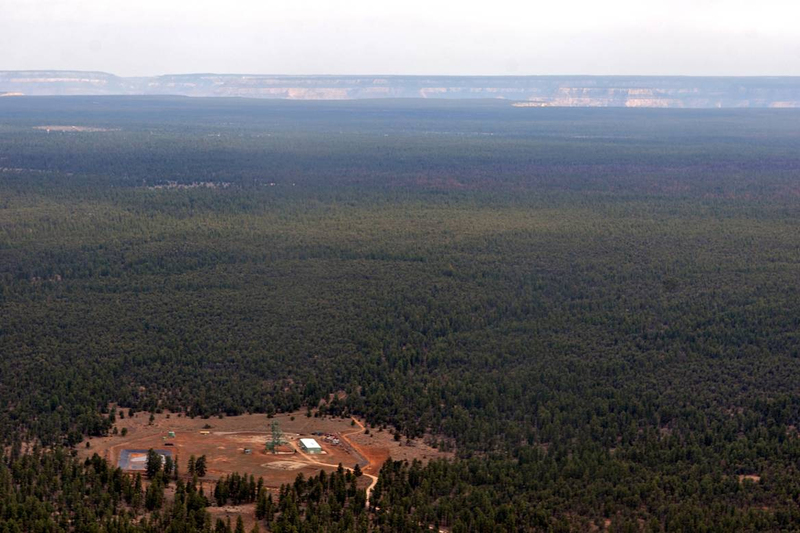 "Failure to consider new, comprehensive groundwater studies done during the 1990s for the region south of Grand Canyon is unconscionable," said Roger Clark of the Grand Canyon Trust. "Why would the Forest Service intentionally ignore information that could prevent permanent harm to springs, which are the sole source of water for Havasupai people and lifeblood for Grand Canyon plants, animals and hikers?" Plaintiffs in today’s suit include the Havasupai Tribe, Grand Canyon Trust, Center for Biological Diversity and Sierra Club. The suit seeks injunctive relief ceasing all mine operations and enjoining the Forest Service from authorizing or allowing any further mining related activities at the Canyon Mine site pending compliance with the law. To view a copy of today’s complaint, click here. The Canyon Mine is located on the Kaibab National Forest six miles south of Grand Canyon National Park. The mine’s original approval in 1986 was the subject of protests and lawsuits by the Havasupai tribe and others objecting to potential uranium mining impacts on regional groundwater, springs, creeks, ecosystems and cultural values associated with Red Butte. Above-ground infrastructure was built in the early 1990s but a crash in uranium prices caused the mine’s closure in 1992 before the shaft or ore bodies could be excavated. Pre-mining exploratory drilling drained groundwater beneath the mine site, eliminating an estimated 1.3 million gallons per year from the region’s springs that are fed by groundwater. A 2010 U.S. Geological Survey report noted that past samples of groundwater beneath the mine exhibited dissolved uranium concentrations in excess of EPA drinking water standards. Groundwater threatened by the mine feeds municipal wells and seeps and springs in Grand Canyon, including Havasu Springs and Havasu Creek. Aquifer Protection Permits issued for the mine by Arizona Department of Environmental Quality do not require monitoring of deep aquifers and do not include remediation plans or bonding to correct deep aquifer contamination. Originally owned by Energy Fuels Nuclear, the mine was purchased by Denison Mines in 1997 and by Energy Fuels Resources Inc., which currently operates the mine, in 2012.